Are you looking for the best Executive Limo Wedding Car Hire Birmingham? 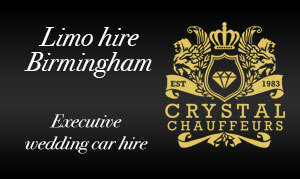 Crystal Chauffeurs is your one stop shop for all of your executive car hire Birmingham needs. Hiring a car for a wedding, or prom has always been popular, but now it is becoming more and more popular to hire a fancy car for nights out, events and even airport and executive travels. Crystal Chauffeurs have several years of experience in the car hire industry, we are highly professional in what we do and offer a wide range of luxury vehicles for any event you wish. We understand that each and every customer will have different preferences in what they need out of their car hire, which is why we work around you. We do not shove any fixed packages your way, we take on board what it is exactly you need to make sure that you get the absolute best on your big night. We offer fully customised executive, wedding and limo hire services Birmingham, so you will be able to pay for what you use, we will tailor our services to your needs and not vice versa. With our huge range of vehicles and limousines you are sure to find the perfect car for whatever your event may be. May it be your wedding day, prom evening, for corporate travel or airport transfers, or you simply want to feel like a celebrity whilst sightseeing, we will have the perfect car for you. Unlike some Executive Limo Wedding Car Hire Birmingham companies, Crystal Chauffeurs makes the wholes process very simple and easy. All you have to do is make a simple phone call and you will have your booking confirmation as soon as possible. If you are still undecided in what it is that you want, then you are more than welcome to browse the website more, or even come down and have a look for yourself about what kind of vehicle you want. You can speak to one of our friendly advisors who will give you professional advice on what they feel is best for you. You can have special extras too, in our limousines you can have a karaoke machine, you can have the vehicle decorated with balloons and have champagne with your friends and family. If you are using one of our wedding cars, you will be able to have it decorated in the colour scheme of your wedding, giving you the best possible experience in transport for your special day. Our well trained, professional chauffeurs will be there to drive you to wherever it is you are going. They are very polite, and you will not need to worry about having a designated driver for your evening. Al of our vehicles are serviced on a regular basis and well maintained to ensure that you do not run into any glitches that may end up ruining your evening. Our chauffeurs promise to get you to your destination on time and in a fashionable manor, all you have to do is enjoy the ride. We pride ourselves in offering first class executive travel for our customers in Birmingham, it is becoming more and more popular and we know that with our fine choice of vehicles you will be blown away with choice for your needs. Give us a call on – 0800 4488895 to book the vehicle of your choice. One of our advisors will be happy to help.